Algoma University recently joined the OUA for women's and men's soccer. While yes, this is a huge advancement to moving into a full-OUA combatant and having teams join, how much is it really worth it? Week one, we saw the women's team get destroyed by the Western Mustangs 17-0 and 13-0. The men felt the same pain, as Western defeated the Thunderbirds 11-0 and 6-0. Four of the OUA West teams are going to have to go up to Sault Ste. Marie to play Algoma for a doubleheader -- no point sending them up there on an eight-hour drive for one game. Some cost-benefit analysis would go a long way. Say a team situated in Waterloo goes to Sault Ste. Marie for a weekend doubleheader against the Thunderbirds. There are approximately 28 players, two coaches and three athletic therapists, which equates to approximately nine rooms. The team will stay at their sponsored hotel, which will drop the price from $130 a night to approximately $100 a night. 9 rooms X $100/night (x2 nights) = $1,800 to stay in a hotel. Oh yeah -- multiply that by two because of the men's and women's teams. So $3,600. Transportation can be figured in two ways. Obviously the team will be on a team bus, which will also have a discounted price. The average price for a charter bus is about $950 a day, so let's say $2000 for three days (Friday, Saturday, Sunday). Not including food and amenities, the price of a trip to Algoma to play four games (two men and two women) is approximately $5,600. Is $5,600 worth four almost inevitable wins with blowout written all over them? Schools that are dealing with cuts or do not have the same funding for their soccer teams as others may struggle to find a way to get their teams up to Sault Saint Marie just to play Algoma. Not just that -- but what about the teams that don't play Algoma? An easy win comes to most, but if people are struggling for goal differential and never played the Thunderbirds, they could be out of luck for a playoff spot. It's an issue for the consistency of the OUA. I applaud the OUA in trying to find a way to grow its organization to incorporate all schools across Ontario. But until some stronger competition comes out of a school that's an average of eight hours away from the majority of the other Ontario schools, it's not worth it to deteriorate the athletic department's funding practices. This is a poorly researched article. First, for OUA league play, teams may dress up to 18 players. So the idea of 28 players for each team travelling to Algoma is wrong. Roster size is up to each university. That really throws off your room/meal estimates. 'Transportation can be figured in two ways.' you presented one but not a second way.?? 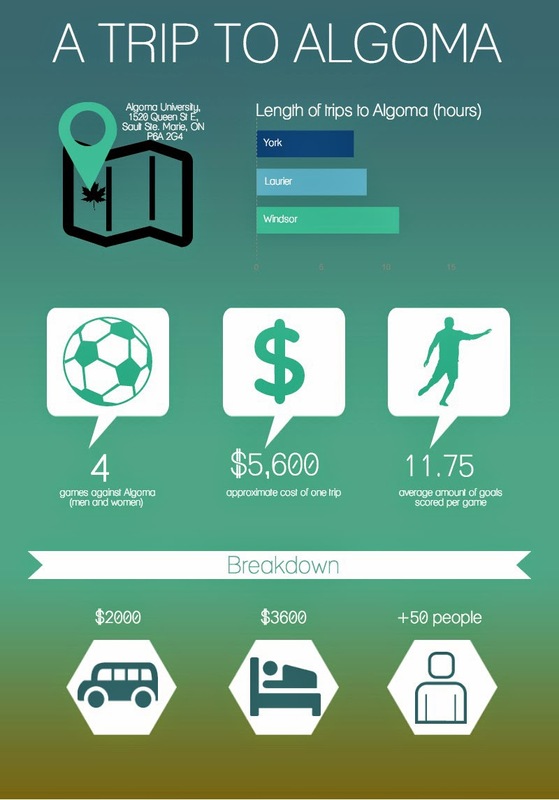 For OUA soccer, each university sets its meal money, there are no amenities money given out. Again this changes the cost estimated in this article. Algoma had to apply to enter the OUA, the Athletic Directors would have know what their budgets are, and the cost associated to going to Algoma. Yes there are cuts being made but ADs were well aware of the cost. 'but what about the teams that don't play Algoma?' OUA soccer is divided into two conferences (East/West). Algoma is in the West. Each team in the West plays Algoma, either back-to-back at home or away. This alternates each year. So there is no consistency issue. Moreover, goal differential is 7th in the procedure of tie-breaking a standing so it is unlikely to affect playoff positioning. Lastly, each university will only travel to Algoma every other year. So average out over a two year span and the cost is much lower than what is presented in this poorly researched and verified posting.